Glenn and I decided to try our hand at dog sledding. An old school bus drove us up Cougar Mountain to a dirt track, where an even older bus with snow chains was waiting to take us up the final ascent. It wasn’t an easy journey, with the bus crashing into enormous potholes and fishtailing up through the snow, but eventually we arrived at our destination, a hut in the side of a bulldozed snow-bank, where we were greeted by some cute puppies. Down here in the relative warmth of BC, pure huskies are too furry to use, because they overheat if they try to run in anything over -20C. Here huskies had been crossed with greyhounds and other small dogs to make a small, short-coated animal more suited to the local climate. We were introduced to the sled teams, all lying around tied to chains in the snow, looking disconsolate and bored. Our safety briefing could really be condensed into one rule: never get out of the right side of the sled, because that’s where the brake is, and the brake is simply an enormous steel claw embedded in the snow which might possibly pop out and gore you when you weren’t looking. Glenn and I attached harnesses to a couple of the dogs, who took it meekly and without much interest. Then I climbed onto the sled to act as ballast while Glenn stretched the trace out taughtly in front, ready for the mushers to clip on the dog harnesses. All hell broke loose! Suddenly the dogs realised that they were going out to run, and went absolutely crazy with joy. Still attached to their chains, they barked wildly and jumped up and down on the spot or ran around in tight circles. The few dogs that had been released fom their chains dragged their hapless handlers this way and that, until they were picked up bodily and carried to the traces. The world was a kaleidoscope of whirling snow, frothing teeth, and excited barking. It was impossible not to get caught up in the sheer abandoned joy of it, and all of us were grinning madly and laughing, even while frantically trying to retain control of ecstatic dogs and preventing them from tangling everything up in their leads. Finally, somehow, six dogs were attached to each trace, and the four sled teams were ready to move out. Glenn clambered in to the sled in front of me, our handler climbed up behind, and with a cry of “Go dogs, go!” we were off. It was tremendous fun. The sled was a fabric tube slung inside a fibreglass frame, and, seated at ground level with only our heads sticking up in the open, we could feel the ground bumping along beneath our backsides. The dogs kicked up quite a spray as they went, scampering excitedly with the sled bumping along behind, and then one would suddenly stop to have a pee and they would all tumble to a halt in a big pile of kicking legs and tangled traces before sorting themselves out to carry on. The dogs ran along a prepared trail up the mountain, sometimes silently but occasionally snapping and barking. 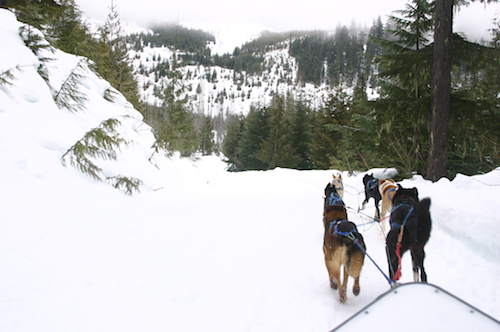 On one occasion, the sled in front ran into difficulties; it seemed that none of their dogs wanted to lead. The mushers decided to take one dog out of our team and swap it for one of theirs. This entailed stopping both sleds and then ensuring that our own did not run away while the other one was being sorted out. I spent an entertaining ten minutes hanging on the back of the sled with one foot on the claw brake and the other on the snow hook, a small anchor, trying to stop them both from being tugged out of the ground by the wrestling and tangled dogs in front. When we moved off again, I stayed on the back of the sled with the musher. I was shown how to stand penguin-footed, with my forward foot along the axis (narrowly missing the downward-pointing teeth of the brake) and the other slanted across one of the runners. It was a comfortable and solid stance. Whenever we got to a hill, the lead dog looked back expectantly and we got off and pushed, running alongside in the deep snow. The trail wound up through snow-capped forest, past ice-powdered lakes and alongside frozen streams, the trees parting occasionally to give glimpses of white, sun-dazzled mountains. With the dogs pulling hard, the only sound was the hiss of the rails on the hard-packed snow. The crisp clean air smelled of fresh mountain pine, overlain occasionally by the strong whiff of dog. On the way back down the mountain and close to home, the sled in front started slowing down, and we pulled out to overtake. Everything went well until we were running side by side, at which point the dogs could no longer contain their excitement and crossed over to the other team to say hello. It all got a bit complicated and we had to hit the brakes before everything got too tangled. Perhaps were not ready to compete in the Iditarod sled race just yet. This entry was posted in Americas, Canada, Travel on 2007/02/22 by Reinhard.